This Alan Stuart Engineering Ltd Carpet Trolley is designed to move carpet rolls easily and without the strain of lifting.. 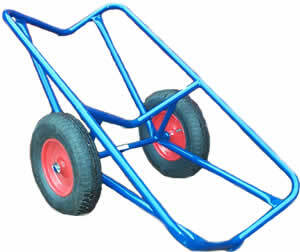 The Carpet Trolley has a moulded frame made from 1″ 1/4 diameter tube which, with fewer welded joints makes for a very strong construction and it has a carrying capacity of 500Kgs. With 16” Heavy Duty Tread Pneumatic Roller Bearing wheels it allows users of this carpet trolley to manoeuvre carpet rolls of upto 5 meters x 30 meters with great ease.